1996 – present. No Attorney in Massachusetts or Rhode Island has been given a higher rating. John Reilly has been awarded Martindale-Hubbell’s highest rating in litigation. 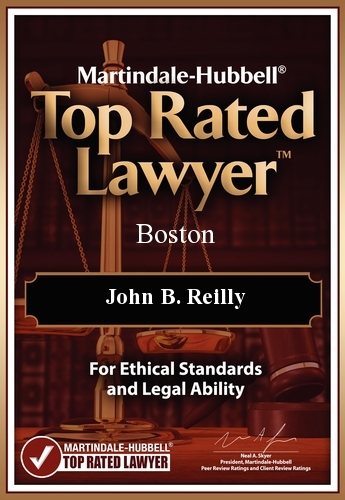 John Reilly was selected as one of Boston’s Top Rated Lawyers. His biography has been included in a special “stand alone” magazine appearing in The Boston Globe. This selection also appeared in The American Lawyer, The National Law Journal, and Corporate Counsel. Martindale-Hubbell award to attorneys who have achieved the Highest Possible Peer Review Rating in both Legal Ability and Ethical Standards. 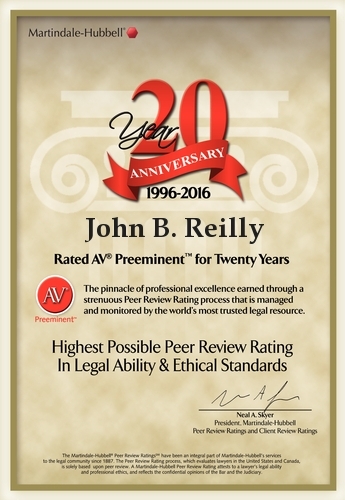 John Reilly & Associates has received this in 2008 to the present.